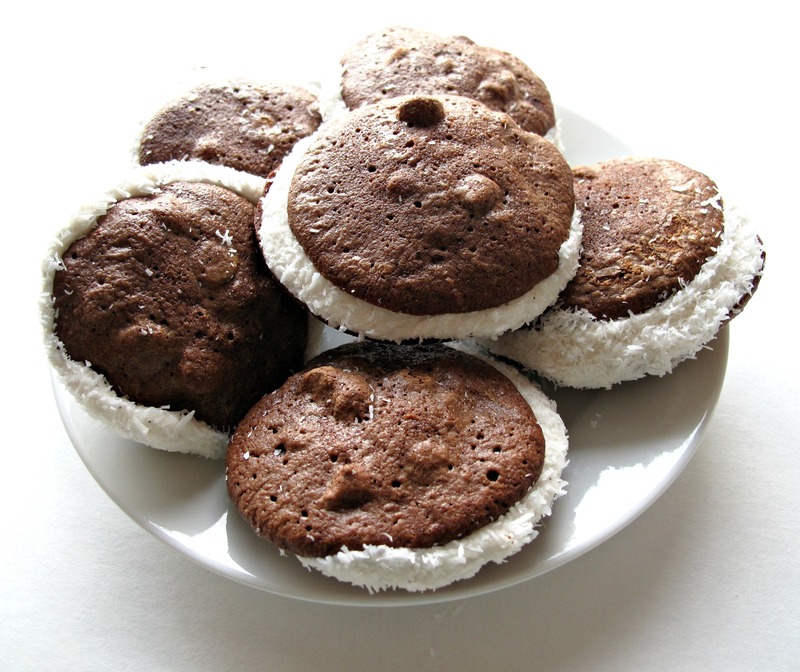 Chocolate Coconut Whoopie Pies are ultra-chocolaty, chewy chocolate chip cookies sandwiched with marshmallow filling and dipped in shredded coconut. Yes, they happen to be kosher for Passover. Yes, they happen to be gluten free. But no one would ever know. They are THAT good. Until I was 12 years old my family lived on Long Island in New York, an easy drive from both sets of my grandparents. Our extended family is small and we spent holidays together. Thanksgiving was at our house. Passover was at my paternal grandparent’s house. Passover is the celebration of the Jews’ exodus from slavery in Egypt. The Passover dinner is full of symbolism and tradition. The very name of the meal, Seder, means “order”. There is an order in which the Passover story is shared through a participatory reading of the Passover story. There is an order to the meal itself, starting with the reading, followed by a festive meal, and concluded with song and prayer. Depending on the level of observance and ages of the participants, a Passover Seder can last from 30 minutes to several hours! During the eight days of Passover, observant Jews abstain from eating leavening, grains (except in the form of matzah), legumes, and anything derived from grains (corn syrup, soy lecithin, etc.). The degree to which the “rules” are followed by each individual varies according to the degree of religious observance and personal preference. Passover is particularly full of tradition bound foods. There are some Passover foods, like matzo ball soup and gefilte fish, that are served at Seders around the world. Other foods are family traditions. My grandparents served a gelatin based dessert that was a cross between jello and mousse. One coffee dessert for the grown-ups and one strawberry dessert for the kids. It was light, fluffy, and creamy. Many years later, when I started hosting my own Passover Seders, I searched unsuccessfully for a recipe to duplicate that dessert which, for me, embodied both memories of Passover and my grandparents. In lieu gelatin molds, my family developed our own sweet Passover traditions. I know exactly which foods my kids expect to enjoy during Passover and have made sure that those recipes are written down! 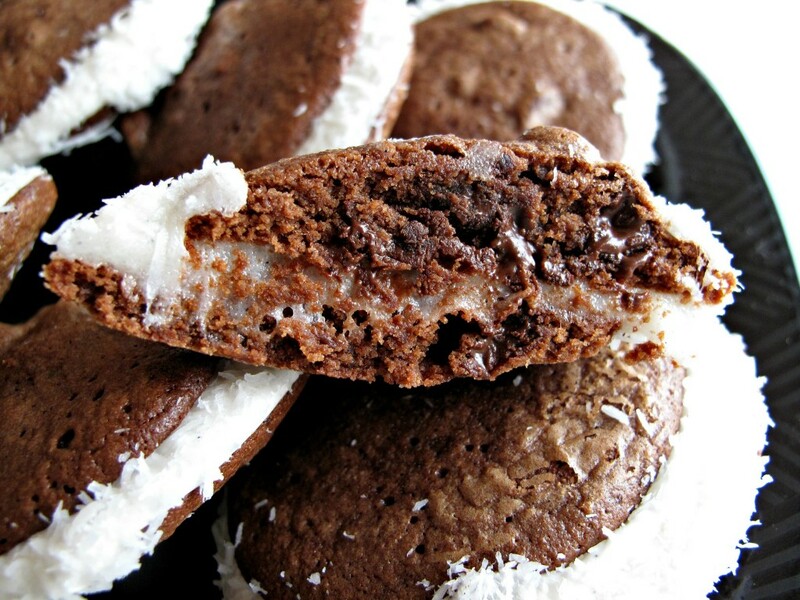 Chocolate Coconut Whoopie Pies are this year’s addition to the favorites list. These whoopie pies start with chewy double chocolate chip cookies. Because there is no leavening used, the cookies aren’t cakey like regular whoopie pies. The scant 3 tablespoons of coconut flour called for in the recipe is not a typo. That tiny bit of coconut flour and cocoa combine to create 20 individual cookies that get sandwiched with marshmallow filling. The vanilla marshmallow filling required a few Passover adaptations. Kosher for Passover marshmallow crème is available, but I couldn’t find it at my local supermarket. I used Passover marshmallows instead. For Passover confectioner’s sugar, I easily made my own. Regular confectioner’s sugar is finely ground cane sugar with corn starch. For Passover confectioner’s sugar, I ground regular white sugar with potato starch in the food processor. I make a few cups at the beginning of the holiday and use it as needed in recipes throughout the week. 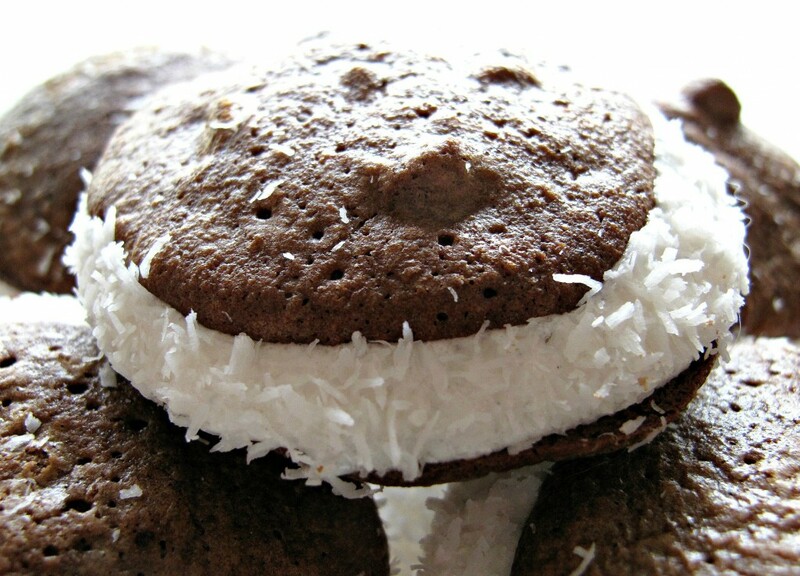 Chocolate Coconut Whoopie Pies will be a year round favorite for anyone who enjoys a chewy cookie. Passover friendly and gluten free are bonuses. Though the filling loses its fluffiness after the first day, the whoopie pies remain chewy and flavorful for up to 5 days. In the bowl of an electric mixer, cream together the coconut oil and the granulated sugar. Add the eggs, one at a time, and the vanilla. Mix to combine. Beat in the coconut flour and cocoa. Use a small scoop, or teaspoon to place scoops of dough onto the cookie sheet, at least 2 inches apart. Bake for 12 minutes. Allow the cookie to cool on the baking sheet for about 10 minutes before placing on a wire rack to cool completely before filling. Measure the coconut into a small bowl. Microwave the marshmallows in a large bowl about 40 seconds - 1 minute, just until puffy and melted. Watch carefully so that the melting marshmallows don’t erupt over the sides of the bowl. Remove from the microwave and immediately stir in powdered sugar and vanilla. Make sandwiches by place a heaping tablespoon of marshmallow filling onto a cookie. Gently press a second cookie on top of the marshmallow to spread the filling to the edges. 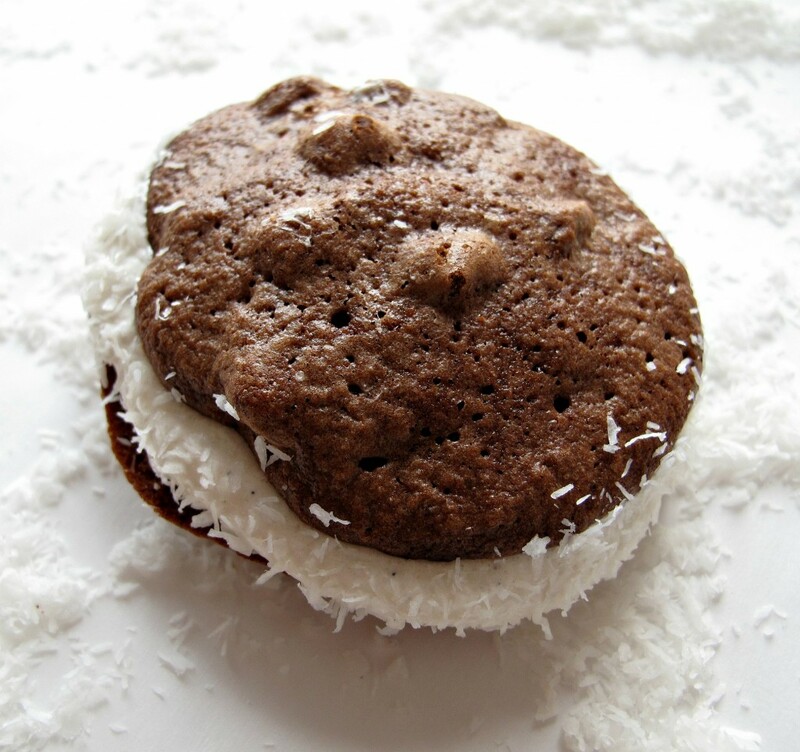 Dip the edges of the cookie sandwich in the coconut. Store in an airtight container at room temperature for up to 5 days. After the first day, the filling will lose its fluffiness, but will remain chewy and flavorful. If mailing these cookies, double wrap individual cookie sandwiches in plastic wrap immediately to preserve freshness for as long as possible. Note: To make 1 cup of Passover confectioner’s sugar, use a food processor to grind 1 cup of granulated sugar and 1 tablespoon of potato starch into a powder. This takes several minutes. Double wrap individual cookie sandwiches in plastic wrap before placing in an airtight container or ziplock bag. Wendy these look fantastic! I can’t believe they are gluten free 🙂 I haven’t made whoopie pies in so so long … I really need to change that. Hope you are having a wonderful week!! Thanks, Ashley! I had never made whoopie pies before and am very pleased with this Passover and gluten free version! 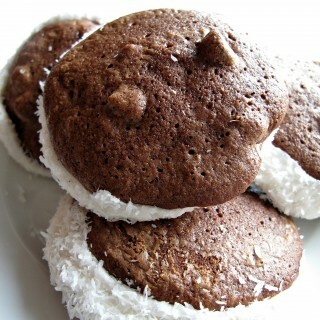 They aren’t cakey like regular whoopie pies but they are chewy and chocolaty and delicious. 🙂 Have an excellent rest of the week! I loved reading about your family traditions. Thanks for sharing! This recipes sounds pretty fantastic and whoopie pies have been on my culinary bucket list for a long, long time. Beautiful! Thanks, Tricia! 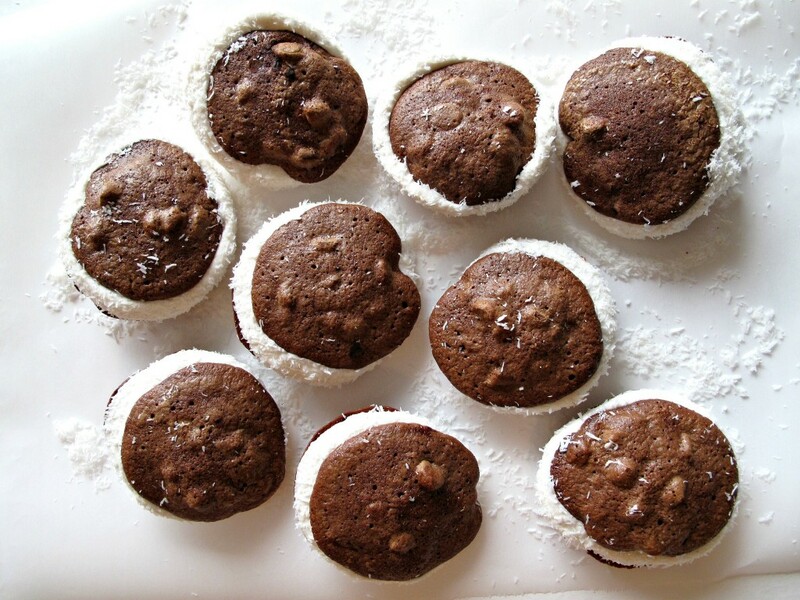 These aren’t your typical whoopie pies but they did get rave reviews from my “taste testers”. 🙂 Chewy and chocolaty transcends grain free! These look amazing! I have always wanted to try Whoopi pies, thanks for the recipe! I so agree, Lorraine. Nostalgic food tastes better. 🙂 Have a great holiday weekend! Thanks, Dini! I love learning about different cultures and cuisines. Your recipes always fascinate me. You draw from so many cultures and introduce me to combinations I hadn’t tried. 🙂 Getting together with family is the best part of any holiday to me. Its so hard when family is spread out across the country or the world! These look amazing!! Love the chocolate and coconut combo. Wendy, I love this recipe! My husband eats GF and we are in full-on Passover mode, so I will totally make these for him in the next day or two. Excited! Thanks, Angie! The only thing “missing” from these whoopie pies is flour, making them a gluten free and/or Passover delight! Just found this recipe and made it the morning for a GF DF person. However, it is so thin I can’t scoop them into a cookie. Usually with coconut flour it starts getting thick very fast. I have never had this happen. I put the dough in the fridge but I am worried when I cook them they will spread too much. Hi, Charlotte. The batter should be thick enough to scoop and hold its shape without refrigeration. I can only make guesses about what may cause the batter to be thin. The coconut oil should be solid (NOT melted) when used. Could that be the problem? If your batter is still very thin after the fridge, and you are worried about spreading, I suggest trying a cupcake pan. Grease/spray the cups well before adding a scoop of batter. I hope this helps! Yes, my oil was liquid. It is getting thicker and I have my oven preheating now. So glad we could figure it out! I hope your enjoy the cookies alone or as Whoopie Pies! Let me know! I cooked the first pan and they were thin but I know they are supposed to be thinner than regular cookies. I switched my oven to convection for the second pan and they had just a little more plump look in the middle. They seemed to all have cooked very well. I haven’t put them together yet because I want to take some to my sons tomorrow and want them to be real fresh. Wendy, these look amazing! I love the extra coconut touch! Thanks for bringing this by Throwback Thursday! Yum! These look perfect for Passover… or for just because! Thanks so much for sharing at Throwback Thursday! Could I please just have one or maybe two right now? These look wonderful, thanks so much for sharing with us at Full Plate Thursday! I would love to share a plateful of whoopie pies with you, Miz Helen! Thanks for hosting Full Plate Thursday! Yum! I eat gluten free and these look wonderful! Wow! Another decadent treat! Thank you so much for sharing the passover traditions, too. I love learning about other them. Pinned! 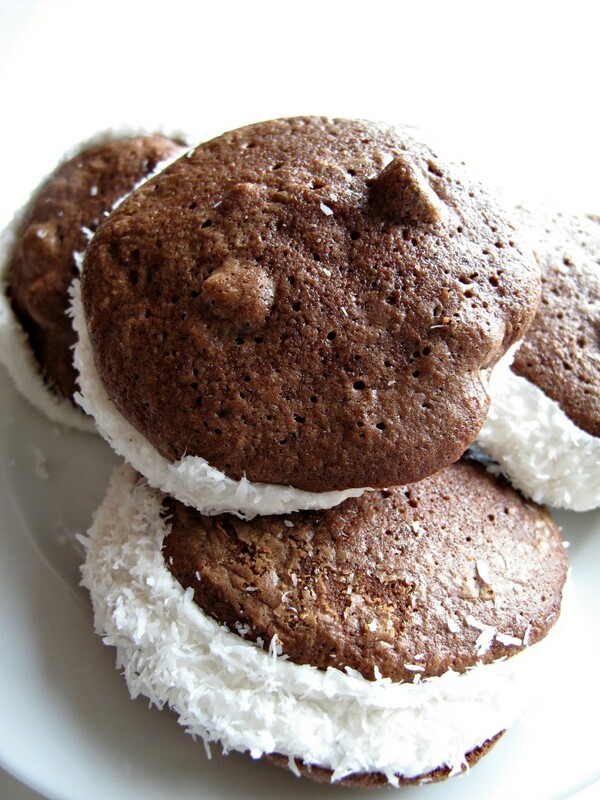 I’ve never had a whoopie pie coated in coconut before – it sounds sooo good! Thank you for linking up with our Merry Monday party this week! Your Whoopie Pies will be fabulous! Thanks so much for sharing your awesome recipe with Full Plate Thursday. Hope you have a fantastic weekend and come back soon! These look yummy! Thanks for sharing at Over the Moon. We look forward to seeing you again next week.